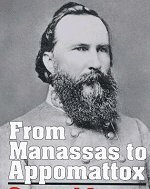 On the evening of April the 8th, 1865 General Robert E. Lee and the remnants of his once-proud Army of Northern Virginia arrived in Appomattox County one step ahead of the pursuing Federal Army. 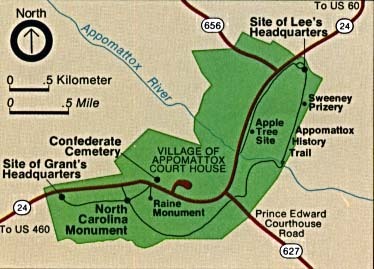 Lee's hope was to reach Appomattox Station on the South Side Railroad where supply trains awaited. 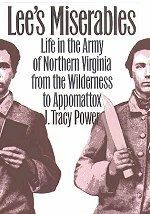 The words of the soldiers themselves provide a view of the army's experiences in camp, on the march, in combat, and under siegefrom the battles in the Wilderness to the final retreat to Appomattox. Having moved ahead of the rest of Lee's army, General R. Lindsay Walker led a detachment of reserve artillery to bivouac near the station. 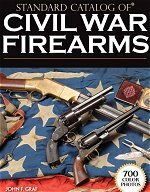 It was not long after their arrival -- around 4:00 -- that Federal cavalry, riding hard from the south, attacked the waiting supply trains and then assaulted Walker. This cavalry, under command of General Philip Sheridan, was merely a harbinger of the fast approaching Federal columns. 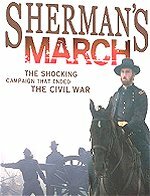 Sheridan's horsemen repelled Walker's detachment -- Lee's much-coveted supplies were now in enemy hands. 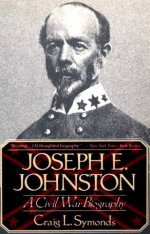 In the meantime, the majority of Lee's forces were setting up a temporary camp one mile north of Appomattox Court House -- the small town lying between the Confederates and the station. Word of the victorious Federal advance soon reached the camp. 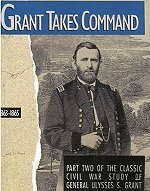 The beleaguered Confederates realized that Grant's men had the upper hand. 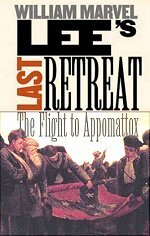 A Confederate trooper reflected: "I felt myself now to be near physical collapse... expecting to go into battle in the morning." 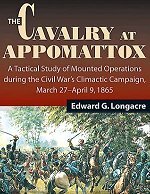 The expectation was validated when, at 2:00 A.M. on the morning of April 9th, Lee ordered General Gordon's II Corps to move into line of battle west of Appomattox Court House. Lee had met with Generals Gordon, Longstreet, and his nephew, Gen. Fitzhugh Lee earlier that evening and decided to throw a portion of his infantry against Sheridan's men. 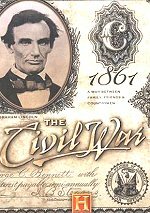 He certainly did not expect to have to fight Federal infantry, believing that he had outmarched most of Grant's troops moving west from Farmville. At 9:00 that morning, Gordon's II Corps was ordered forward to break through the Federal cavalry and proceed to the west -- in the process recapturing the station. Protecting Gordon's right flank was Fitzhugh Lee's cavalry. Gordon's Corps, "fought to a frazzle" during the previous week, was a mere shadow of it's former strength. The combined force of the infantry and the cavalry numbered no more than 9, 000 men. "Fitz" Lee's cavalry spearheaded the advance, and the lines of scattered, grey-clad infantrymen lurched forward; most men somnolent from their early rising yet nervous with the anticipation that manifests itself before an impending battle. As the line moved up the sloping ridge along the Richmond-Lynchburg Stage road, the enemy came into view. Situated on the crest of the hill and beyond were two cannon of Federal artillery and a brigade of cavalry under General Charles H. Smith. 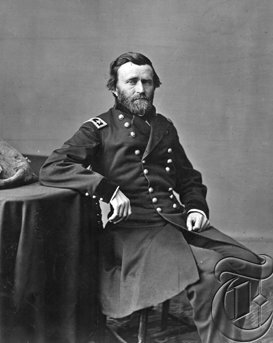 Smith had been ordered by his division commander, Gen. George Crook, to hold his position as long as possible. The Confederates, as exhausted as they were, advanced through the artillery and Smith's men fled in their wake -- only to be supported at the last moment by Mackenzie's and Young's cavalry brigades. 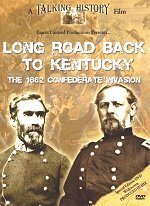 The combined force once again slowed the Confederate advance, but most of "Fitz" Lee's cavalry skirted the Federals and escaped westward toward Lynchburg. 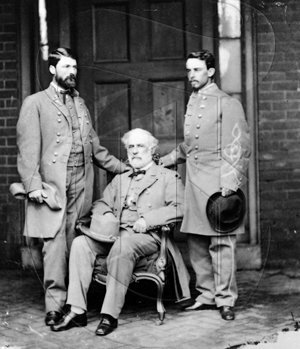 It now became apparent to Gordon that Lee had grossly underestimated the Federal strength. 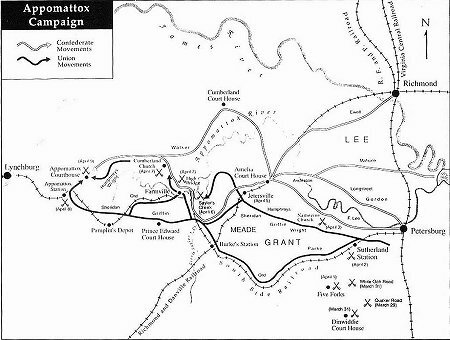 In truth, Grant had not only positioned more cavalry in front of Lee during the night, but had also force-marched almost three entire corps of infantry along the South Side Railroad to arrive at Appomattox Station during the night. Most of the Army of the James (under Gen. Edward Ord) -- the XXIV and elements of the XXV (United States Colored Troops)-- had moved to block Lee's western escape route with the Army of the Potomac's V Corps in tow. Gordon and his battle-worn foot soldiers now faced advancing lines of dark blue-clad Federal infantry -- men of the XXIV and XXV Corps. As Gordon's men began to skirmish with the Federal Infantry, two Cavalry divisions converged on the Confederate lines alongside infantry of Griffin's V Corps. It was only a matter of time before Gordon's men broke. 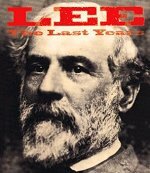 The Confederates withdrew from their advanced positions and General Lee ordered truce flags sent out at about 11:00 that morning. Meanwhile, back at his camp, Lee was deep in decision. 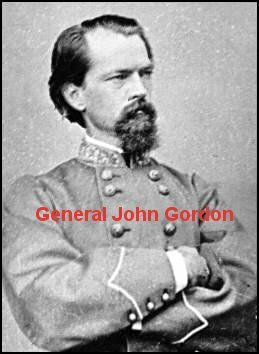 Not only had Gordon been defeated to his front, but Federals of the II and VI corps had pinned Longstreet's rearguard in from the north. 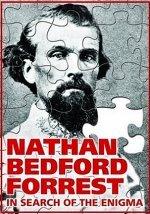 Grant had surrounded Lee on three sides, leaving the northwest as his only unimpeded route. 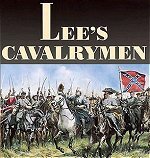 Lee knew that there was no hope of supplying his army by retreating in that direction. He was in "checkmate": he had no other options left. 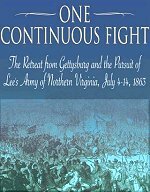 The disconsolate Lee sent word to Grant that he was prepared to surrender the Army of Northern Virginia. Point one: Appomattox Station; The trains were not burned by Custer. 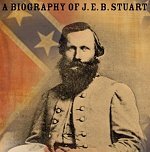 His men - some of whom were railroad men, drove them up and down the tracks blowing the whistle, and on the 9th when General Lee asks General Grant for help in feeding his men - Grant replies by sharing the food that had been on the trains at Appomattox. Point two: Lee surrendered 28,231 men, who received paroles. Many hundreds of others just when home in the final days of the campaign. 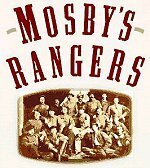 The number of disserters from the CSA Army of Northern Virgina was so great the yankees did not even attempt to stop them from just going home. There were too many to care for or imprison. Thank you. 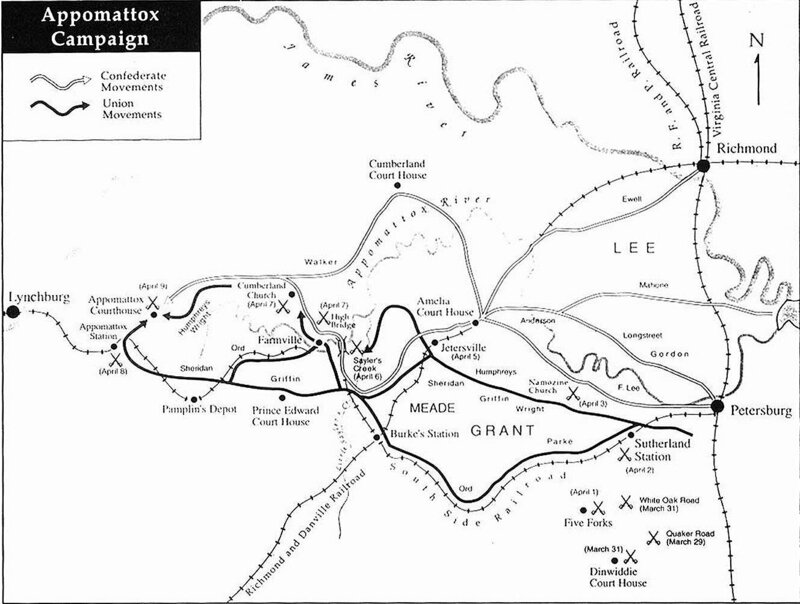 At daybreak the Confederate battle line were formed to the west of the Appomattox village. The Union soldiers were in position in front of the Confederate line with a line of cannons and earthworks. 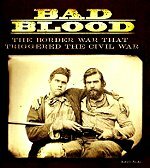 A Confederate soldier recalled that morning, "over a few little sticks of wood I boiled and drank the hottest cup of coffee I ever drank in my life." Another solider remarked how the morning "was [a] bleak, [and] misty morning, and after the line was formed for the charge, the men, who shivered in the morning coolness, built a fire of fence rails and I rolled myself up in my blanket and soon fell asleep..nearby was a field piece that was to be fired as a signal for the line to advance." 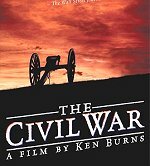 The federal artillery in the front of the Union line began to open cannon fire, at which point the Confederate signal for attack was sounded. The Confederate troops began at a quickstep and raised their voices in the Rebel yell. 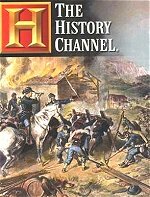 One soldier remarked about the advance, "It was my fortune to witness several charges during the war, including the famous third day's attack on the heights of Gettysburg, but I never saw one so magnificently executed as this. Our men advanced as regularly as though on parade...Presently they broke into a double quick, with old time yell, and [an] irresistible rush." This Confederate advance lasted from about 7 AM till 9 AM, at which time the troops were forced into the village. The Confederate line retreated, at which time Gordon sent word to Lee that he could no longer hold his line. 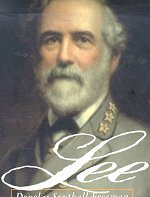 Lee realized he could no longer go forward to Lynchburg, and sent a flag of truce to Sheridan. 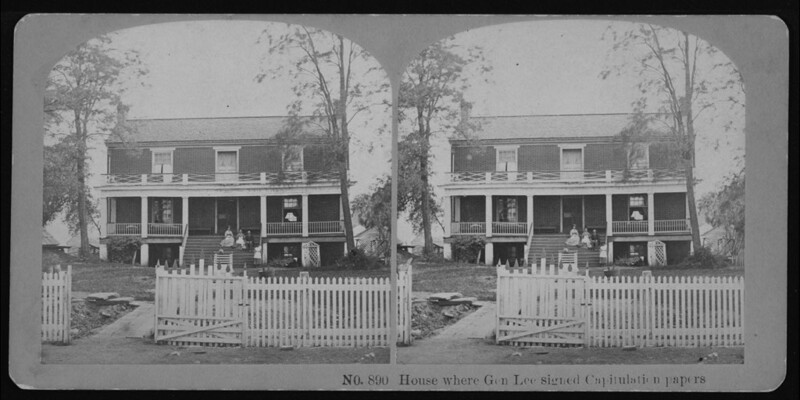 Negotiations began between General Robert E Lee and General Ulysses S Grant in the McLean House near Appomattox Court House, and the terms of surrender were agreed upon. The papers were signed, at which time Lee left for his headquarters in the court house. As he passed his men with tears streaming down his face, he said, "Men, we have fought through the war together. I have done the best that I could for you."